I haven't gotten a chance to taste Bell's Planetary Beer yet (boo!). Hopefully soon on that one. Soon you may be able to drink beer brewed with yeast that traveled to space last year. Ninkasi Brewing Company is an independent craft brewery based in Eugene, Oregon. Last year, the co-founders brewed up up a crafty scheme (puns intended): the Ninkasi Space Program (NSP). The goal of the NSP was to send brewer's yeast to space and return it safely for brewing. In July of 2014, Mission One of NSP via the Civilian Space eXploration Team (CSXT) and Team Hybriddyne launched a rocket into space carrying 16 vials of brewer's yeast. Unfortunately, this yeasty payload was lost in the Nevada Black Rock Desert for 27 days, leaving the yeast not viable for brewing. Bummer. But NSP didn't give up. In October of 2014, they launched a second payload of yeast on Mission Two with the private spaceflight corporation UP Aerospace, Inc. Mission Two traveled 77.3 miles up (the distance to "space" is ~62 miles) and then returned safely to Earth with viable yeast. Yay! "Ground Control boldly combines local and out-of-this-world ingredients. This rich, complex Imperial Stout is brewed with Oregon hazelnuts, star anise and cocoa nibs, and fermented with an Ale yeast that survived a trip to space and back. Mankind will enjoy the sweet finesse of this beer that only fares better with time." 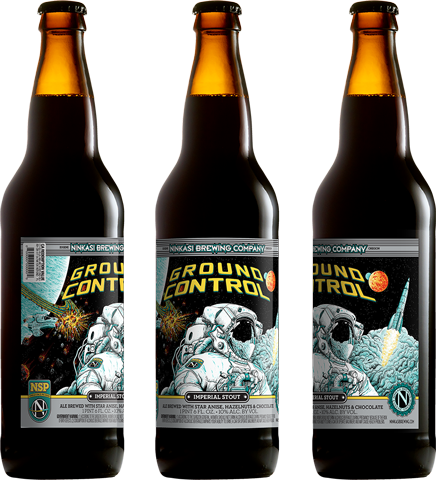 Ground control will be available in 22 oz. bottles as of April 13, 2015. U.S. distribution areas include Alaska, Arizona, California, Colorado, Idaho, Nevada, Oregon, and Washington. Canadian distribution will be Alberta, Vancouver, and British Columbia. So waaaay over here in the easter U.S. I won't be able to sample the space beer. Ya'll will have to tell me how it goes. Enjoy other space-traveling libations? Consider Japan's Sapporo Holdings Ltd beer made from ISS grown barley or Ardbeg in Space (a whiskey launched into space).